Set in 18k white gold and decorated with numerous baguette white diamonds, this grand complication masterpiece also boasts of an orbital display of hours and minutes. 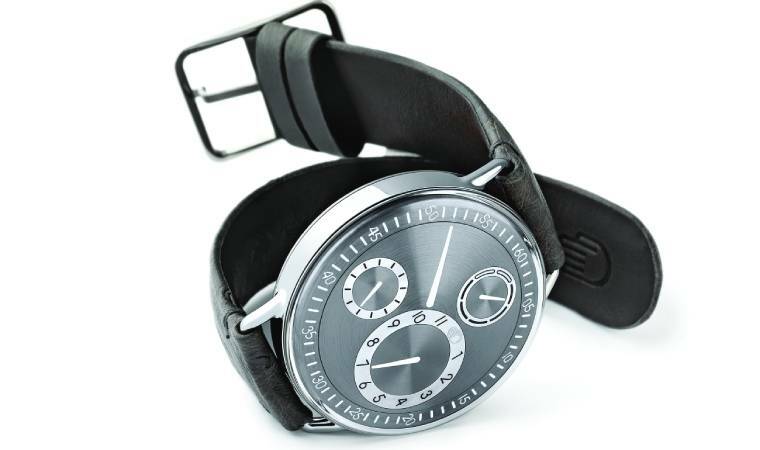 If you think cutting-edge watches are meant only for men, think again! Ladies, the Jacob & Co. Astronomia Tourbillon Baguette is a truly unique timepiece that showcases expert watchmaking craftsmanship nestled in the grandeur of visual poetry. Set in 18k white gold and decorated with numerous baguette white diamonds, this grand complication masterpiece also boasts of an orbital display of hours and minutes. All of this is controlled by the oscillator at the heart of the three-axis tourbillon. Making a grand statement on any wrist, the Astronomia Tourbillon Baguette speaks volume of the futuristic nature of the watches developed at Jacob & Co. The sheer complexity of the exclusive manual winding JCAM10 movement offers a visual treat very few brands are capable of achieving making this a progressive "wrist-worn mechanical entertainment". It offers a three-dimensional view of the globe from the North to the South Pole which rotates once every 24 hours. 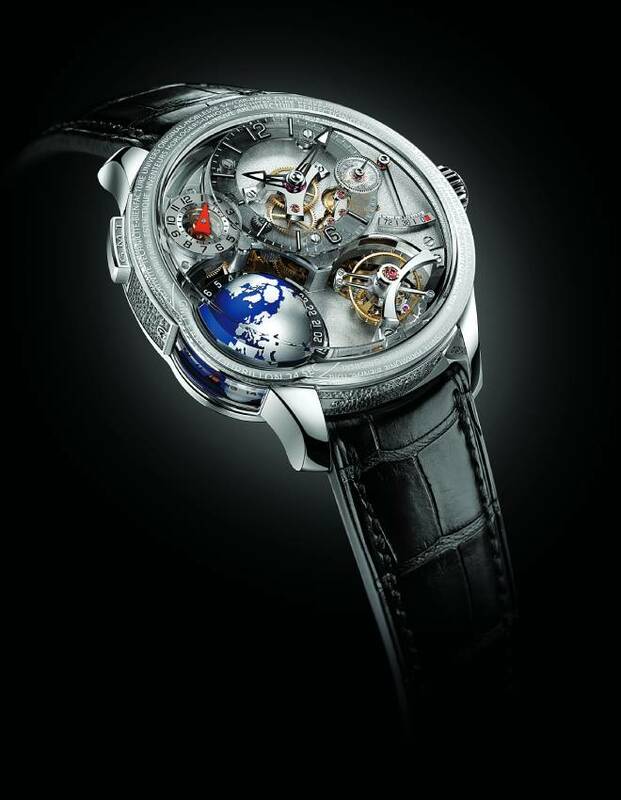 To call the Greubel Forsey GMT Earth an updated version of the Greubel Forsey GMT is an understatement. Pegged as one of the most complicated and visually-complex watches ever made, the GMT Earth is a comprehensive timepiece. It offers a three-dimensional view of the globe from the North to the South Pole which rotates once every 24 hours. Always a visionary in its creations, the watch shows the time in three time zones simultaneously. Dripping with cutting-edge technology, it's unlike any timepiece you'd have ever seen. The GMT Earth is powered by a unique and innovative movement design that works beautifully with a complex sapphire crystal. Futuristic complications with a vintage feel, it's a treat to look at on and off your wrist. The hours, seconds and days are indicated via the discs that rotate on their own axis while the minutes are showcased with a simultaneously 360° rotating disc housing the hour, second and day discs. When you first see the Ressence TYPE 1°RS, you'll find it hard to put it under the 'futuristic' category. Look at the dial closely, and you'll be forced to think otherwise. If you fall under a niche section of watch lovers who are into subtle yet revolutionary timepieces, this is the perfect watch for you. It's signature curved sapphire crystal, which flows to the edge, giving the watch its unique pebble-like shape, looks minimalistic yet acutely inviting. Rooted in industrial design, the watch speaks volume on comfort, reliability and a deeply organic nature of design. There are no hands or crowns just rotating discs within discs. The hours, seconds and days are indicated via the discs that rotate on their own axis while the minutes are showcased with a simultaneously 360° rotating disc housing the hour, second and day discs. Fascinating, isn’t it? Nothing is as it first appears with this watch and that is what makes it so cutting-edge. The 49mm lightweight titanium case with white gold moon phases and light blue sky and rotor add to its lunar inspiration. Signifying a positive future in the realm of high-concept unorthodox horology is the MB&F Moon Machine 2. The timepiece is a result of an interesting collaboration between Finnish watchmaker Stepan Sarpaneva with the artistic concept laboratory of Max Büsser. The Moon Machine 2 is based on the concept of a vertical display of time that is placed perpendicularly to the movement and can be viewed through high-tech sapphire prisms. A rather complex watch, both technically and visually, the Moon Machine 2 is the first watch in the world which brings us projected moon phase display. How is it done? With the help of an optical prism that refracts the hours, minutes and moon discs in their flat position to appear upright to the engine. The 49mm lightweight titanium case with white gold moon phases and light blue sky and rotor add to its lunar inspiration. The Moon Machine 2 is the perfect example of the wonderful impact that a collaboration of two far-thinking individuals can have in the evolution of the horological society. The digits and markers on the side give the impression of floating time that is " anchored in precision". 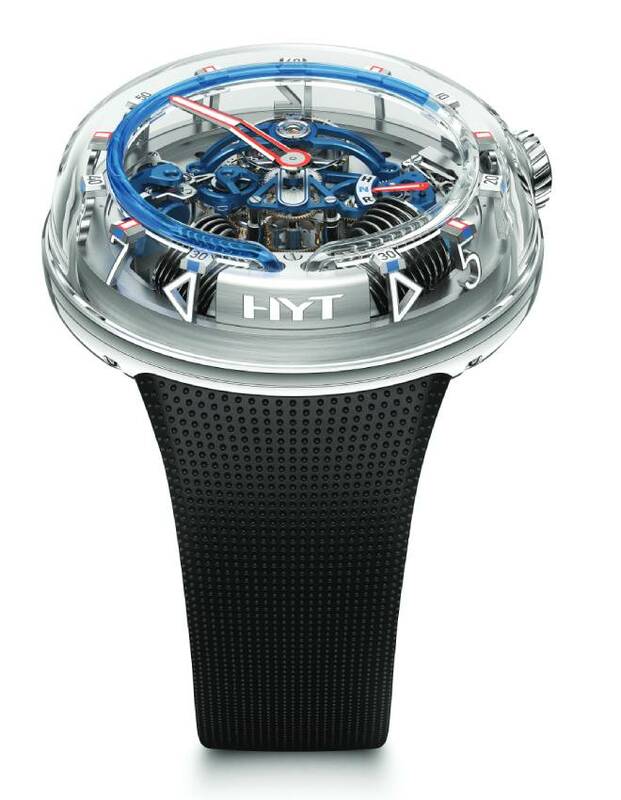 Forward thinking in all its glory, the HYT H2O is the newest watch in town. It offers a radical perspective of time with a new-age concept that is rooted in the continuous movement of a coloured and transparent fluid of time. Combined with a manual-winding mechanical movement, the HYT H20 is a fascinating timepiece that "respects, facilitates and treasures the flow of time". The brand's exclusive patented micro-fluidic module propels time forward through an angled positioning of two bellows at 6 o' clock that are activated by the movement. 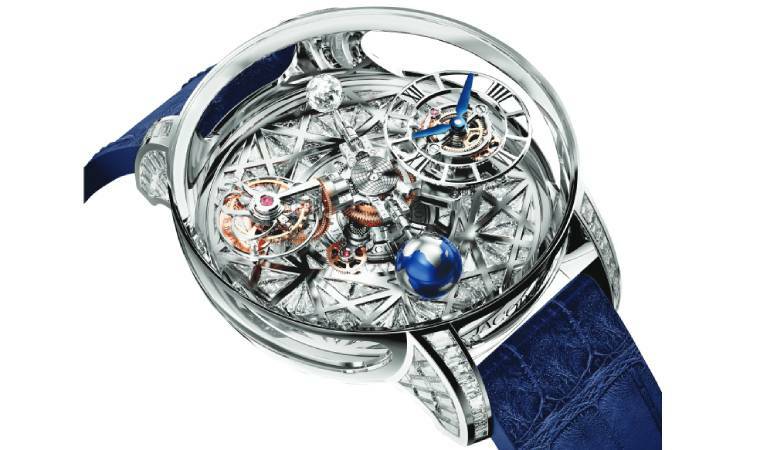 Further enhancing this unique take on reading time is the cloche-like sapphire crystal. The digits and markers on the side give the impression of floating time that is "anchored in precision". 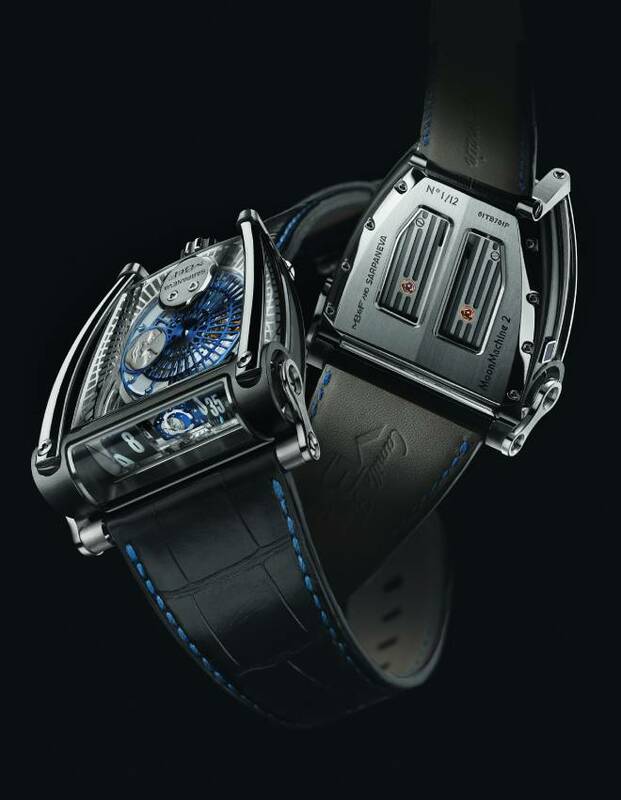 A captivating timepiece that is mixed with futuristic design, traditional haute horology and three-dimensional elements, the HYT H20 is an eye full that does not disappoint. The slight bursts of red on the dial set against the black background of the case and straps make an impression you cannot forget. Blink and you'll miss it! Playing on this, the Urwerk UR-210 ensures that you are glued to your watch dial as you watch the minutes hand approach the end of the hour. What happens then? As soon as an hour is over and the minute hand strikes, the wearer witnesses a “display of controlled energy in the lightening return of the retrograde hand as it snaps back to the start of the next hour.” Cast in black platinum, the irresistible timepiece features a prominent three-dimensional minutes hand that makes a sharp click sound announcing the arrival of the hand at zero and the end of one hour. 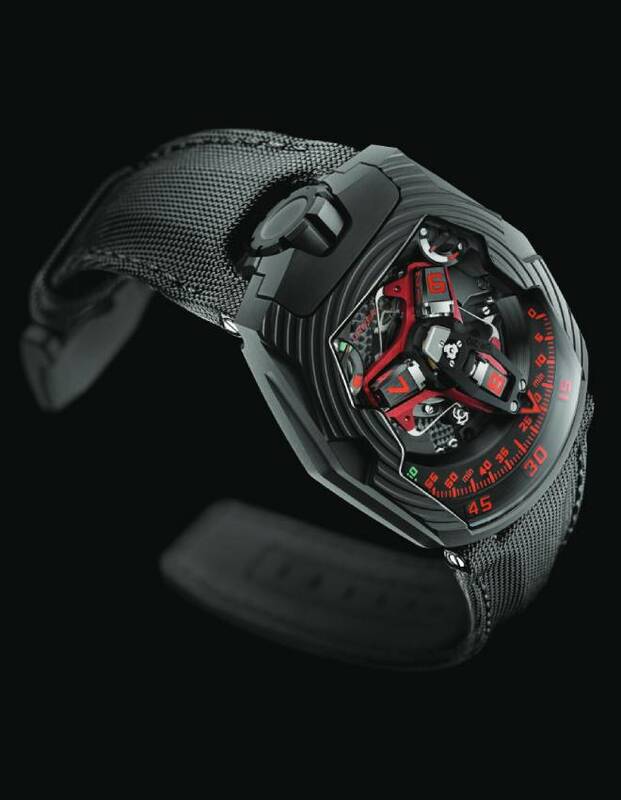 A ground breaking combination of a revolving satellite complication and retrograde minutes, the Urwerk UR-210 is also a show stopper with its aesthetic appeal. The slight bursts of red on the dial set against the black background of the case and straps make an impression you cannot forget.